Mp3 Cover Downloader is freeware: so it's thanks to your donation that we are able to update and mantain it and we'll be able to create other quality freeware software available to the world. 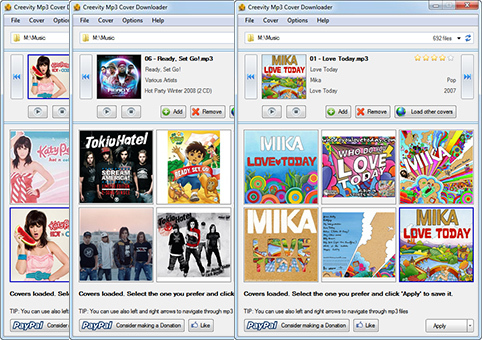 Easily find and add cover images (album arts) to your mp3 files. No matter to which folder you move your mp3 file, the saved cover will be always there for you. Download now the software that will simplify your life: searching and applying the covers for you with a mouse click. Extended compatibility: covers will be shown in Windows, Mac, Windows Media Player, iTunes and many other players. SYSTEM REQUIREMENTS: Windows Xp, Windows Vista or Windows 7. Both 32 and 64 bit version are supported.